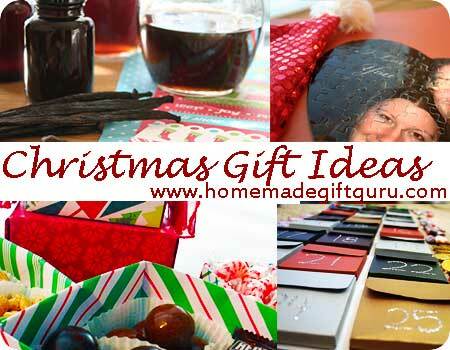 Homemade Christmas gift ideas can save a considerable amount of money, making the holidays more affordable and more fun! They also help us focus more on the people and the moments that make life meaningful, and less on stuff. Below you'll find our favorite holiday craft gift ideas, as well as a few holiday food gifts that we love to give. Wondering what kind of homemade Christmas gifts to make and for who? Remember, homemade Christmas gifts can be exactly what YOU want them to be. Funny... think snowman poop or reindeer noses. Thoughtful... homemade vanilla, mason jar cookie mixes, homemade bath and body. Functional... mug cozies or homemade gift baskets. Cute, Simple and Sweet... for example, DIY candy bouquets or sock snowman. Unique... check out these fun and unique magic bath potions. Made with Love... handmade tower of treats or homemade coffee liqueur for example. Personalized... creative framed photos, photo gifts or a pillow out of his or her favorite pattern. Whether you are making all your gifts this year or just a few, having a handful of good homemade Christmas gift ideas up your sleeve can sweeten your Holidays in extraordinary ways. ...and as my oldest daughter like to say... "It's the imperfections that make homemade gifts perfect!" 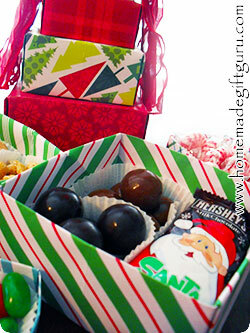 The following homemade Christmas gift ideas are fun and frugal. I hope they inspire joyful times for you and your family, as they have for mine. Nearly all the ideas on this web site can be used for fun homemade Christmas gift ideas, so feel free to look around at your leisure. I particularly like to show you how to make things that you can put your own creativity into and therefore customize for any occasion using patterns and colors you choose. 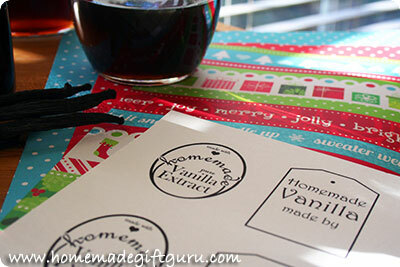 Free Printables make Homemade Gift Ideas a Breeze! 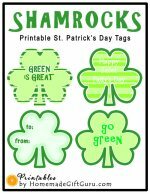 Keep an eye out for free printable gift tags and labels to go with the homemade gift ideas on this website! They will make your homemade gifts easier and they're exclusive to this site, enjoy! Below I've put together several easy tutorials using fun homemade Christmas gift ideas that we've enjoyed in past years. 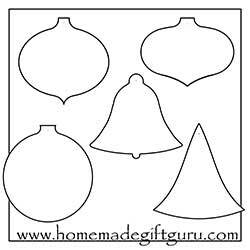 You'll also find lots of exclusive gift tag templates and ready-to-go printable gift tags throughout this site. 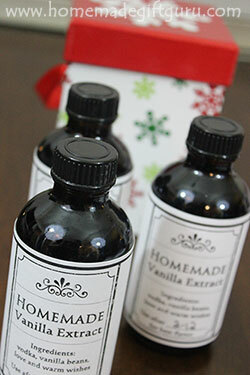 Did you know that you can make your own pure homemade vanilla extract for the holidays... and for a fraction of the cost of pure vanilla from the store?! 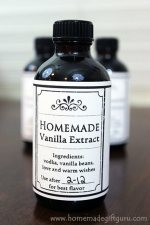 Homemade vanilla is very versatile. It can be used in your holiday recipes and it also makes a great homemade gift for a variety of people! I have two fun ways I make it... One is to make vanilla, then bottle it. You make it ahead of time, and then once the infusion is complete, you bottle what you want to give away individually. This is nice because it just takes a minute of your time, but it's best done several months before the holidays. Or you can make it right in individual bottles... even at the last minute if need be (just be sure to give it with instructions to allow the vanilla time to infuse). You can make your own gift tags or print out the ones I've provided, in each tutorial, to make this an even easier homemade Christmas gift idea. You can match their decor or even have them pick out the fabric ahead of time. These pillows are super easy, super cozy and completely fun to give! 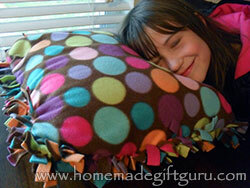 Read more about how to make no-sew fleece pillows here. My family and I have had a blast making these sock snowmen. The creation of these cuties brings the family together and giving them has been delightful. They are so much fun to dress! You can cut thin strips of fabric from any material you want for the cutest little scarves. Read more here including how to customize your sock snowman for couples and specific gift recipients. Be sure to share your sock snowman creations with us as others have done! I love to see them!!! This origami box tower tutorial is a unique homemade Christmas present idea that lets you give a tower of sweet treats (or healthy goodies) with a flare of uniqueness. These are totally customizable using paper and patterns you like. You can include a few homemade treats like homemade truffles or simply pick out some scrumptious store bought treats or even a little something purchased if you so desire (include jewelry, money, gift certificates... anything small really). You could also slip a homemade gift certificate for something that you can provide (example... gift a back massage to your spouse or a day off chores for your child) into one of the boxes. If not, there's no time like the present to get started with some easy food gift ideas. 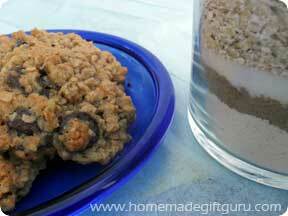 Start with things that are reasonably easy to make but very beautiful and quite tasty to give. 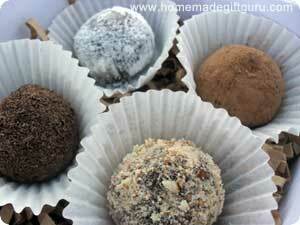 Homemade truffles are yummy and easy to make. There are many ways to flavor them, coat them and decorate them for fun gifts. For example, using origami boxes is a easy, fun and elegant way to give truffles, whether you put together just one in a 2 x 2 inch box or four truffles in a 4 x 4 inch box. Pad the bottom with clean paper shred and put each truffle in a small cupcake liner as shown. There is no cooking involved and they look beautiful! I've provided lots of information on gifts in jars, including recipes in a jar, instructions and ideas for re-using glass you would normally throw out or recycle. 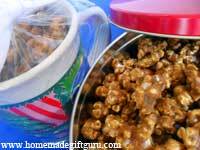 Caramel popcorn is another lovely homemade Christmas gift idea. I've really gotten into making caramel popcorn and I let me tell you... it's fun to package! Gift tins are always fun and I really enjoy packaging caramel popcorn in homemade canisters... start with a canister that is airtight and you'll have an awesome can of caramel popcorn to give! Another idea is to package it inside a Christmas coffee mug wrapped tightly with cellophane! Just make sure it is air tight, to ensure the popcorn stays crunchy. One tip about caramel popcorn... always make extra to enjoy yourself and with your immediate family (they'll likely eat some up either way)! 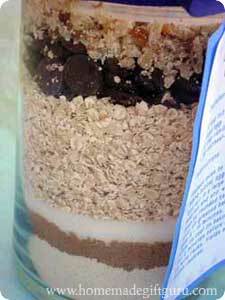 My all about homemade Kahlua page is really popular on this site. It seems that others have enjoyed making Kahlua for gifts just as much as I have. 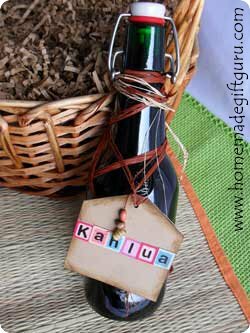 I started making it years ago and found that flip-top beer bottles made excellent containers for Kahlua gift giving. That means you can go out and buy a beer in a flip top bottle and then re-use the cute bottle in came in for your homemade liqueur! This flip-top style of bottle has become more and more widely available since I originally made this post (Amazon has these awesome bottles now! ), making it even easier to make, bottle and give excellent homemade liqueurs. 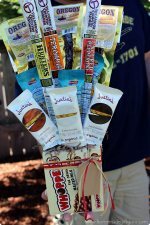 You may also like to learn how to make gift baskets. Gift baskets are a lovely way to package a few items together to make a smashing presentation! Here's a couple ideas for homemade Christmas gifts you can make with things you probably have at home. For example, if you have paper and perfume, you can make homemade scented stationary! Essential oil is great for scenting homemade stationary as well as making several other homemade gifts, such as homemade bath salts. To scent stationary, simply put your stationary in a large plastic zip lock bag with a few strips of scrap paper containing several drops of essential oil or perfume. The scent will infuse into the paper after a few days. Do this with paper, envelopes, cards or even journals. Relaxing ...think aromatherapy essential oils! For example, lavender is extremely relaxing. Romantic ...use a romantic scent like rose essential oil or use your own perfume. Festive ... use scented oils for the holidays such as pine tree, apple spice or pumpkin pie. Make a Template: There are many ways to make your own stationary. Make one beautiful paper and use it for a template. Decorate it using things like stamps, dried flowers, computer fonts and clip art, stickers, pens, paint or anything you can think of on a single piece of paper. Scan Template: Once your stationary is designed, scan it or have it scanned at a local office supply place and print out (or have printed) the desired number of stationary papers. The easiest two sizes are 8 1/2" x 11" (standard printer paper) or 5.5" x 4.25" (you can print two on a standard sheet of printing paper and cut in half). Tip: Either way, plan for a 1/4" border on all sides (unless your printer prints border-less and you choose this option). Thanks for reading through our homemade Christmas gift ideas... I've got lots more tutorials and ideas in progress so come back soon! ...and share photos of what you make here! Snack food bouquets make great homemade Christmas gifts for dad! 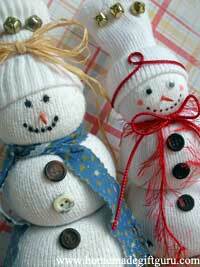 These DIY sock snowmen are one of our favorite holiday craft gift ideas!